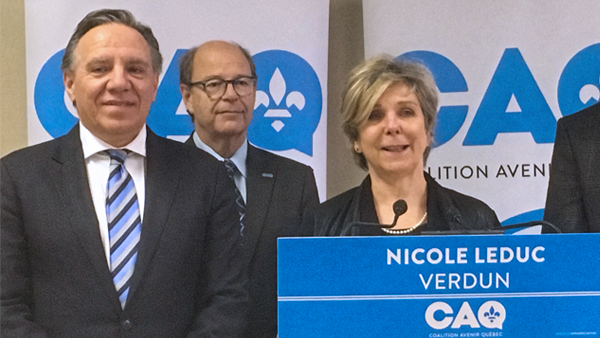 The leader of the Coalition Avenir Québec, François Legault, is pleased to announce that Nicole Leduc, cofounder of the transport company Orléans Express, will proudly represent the CAQ in the riding of Verdun in the upcoming general elections. “Nicole Leduc is an extremely competent business woman who is highly devoted to her community. She is a seasoned manager and holds an MBA in finance. In terms of numbers, she and I are on the same page, and she is also an entrepreneur, a very accomplished woman. Moreover, she is eager to combat school dropout rates, as she has done in the past by volunteering in homework help programs with ‘Pathways to Education’. Quebec needs women like Nicole Leduc in government”, highlighted François Legault. Nicole Leduc has been a proud inhabitant of Verdun for 29 years. An entrepreneur, manager, determined optimist, and advocate for justice, she is involved in politics for the first time in order to improve the daily lives of her fellow citizens of Verdun. “The needs are numerous in this riding, which is home to a large socio-demographic diversity. Eternally optimistic, devoted, and determined, Nicole Leduc wants to build on the great diversity which characterizes the inhabitants of Verdun, in order to create new opportunities that will improve their quality of life. As a resident of Verdun, I see day after day that the concerns of my fellow citizens and families of Verdun are not a priority for Philippe Couillard’s liberal government, this must change.” said the new candidate of the CAQ. “ At the Coalition Avenir Québec, family is at the heart of our priorities, and rightfully so. For example, in Verdun, families with children represent more than half of the population. It is necessary that we bring solutions to all of the day to day problems which confront all of these families. We also see poverty, too much poverty, and hand in hand with that come unfortunate consequences such as a higher school dropout rate. We must reduce the poverty, wherever it is in Verdun.” added Nicole Leduc. “At the Coalition Avenir Québec, our goal is to bring Quebecers together to prepare for the future. To reach their goals, the citizens of Verdun need to be able to rely on a real, qualified MNA, who is proactive and efficient, and most of all present to hear their priorities. I will be that MNA” concluded Nicole Leduc.